The function of a garbage disposal is a relatively straight-forward process – a blade chops up food and other waste you put into it. While a garbage disposal can often go years without causing problems, eventually the disposal will get steak or break down. The good news is, the garbage disposal repair process is generally pretty straightforward, and most people can do it themselves. Before we begin, make sure to follow basic safety procedures: never stick your hand in a garbage disposal. Before considering how to repair your broken garbage disposal, it’s important to be aware of specific symptoms that may prompt the need for garbage disposal repair. If your garbage disposal is noisy, making strange hums, appears jammed, feels clogged or otherwise does not process waste the way it should – it’s time to look into repairing your garbage disposal. As soon as your garbage disposal starts making strange sounds or struggles to grind your waste, STOP running the disposal. Your first step is to grab your hex wrench – most household sets will have the proper 1/4-inch size needed. Fortunately for us, a large majority of garbage disposals will have a place to manually spin the blade as a way to dislodge any waste and free the blades. Insert your hex wrench into the bottom of your garbage disposal and briefly spin both directions. Make sure to hold the garbage disposal, as it is not uncommon for it to be secured to thin plastic. 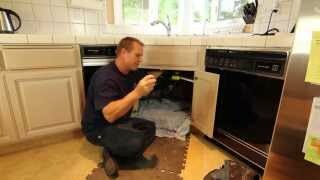 After trying this first step of garbage disposal repair, try to use the disposal as you normally would. If it sounds and operates normally, you’re all set! A secondary method that may work is using the ‘reset’ button at the bottom of your disposal. In short, this button will kick the motor into action and attempt to spin them. In most cases, this should solve the problem. A brief warning, make sure your wrench is no longer in the manual-spin hole or else the rest button push may cause it to spin. Conveniently, these two methods will solve most garbage disposal repair problems. If those two methods do not work – you may want to double check how the garbage disposal is finding power and ensure power is working. Reset the circuit breaker if necessary. How Do I Know if my Garbage Disposal is Broken? If you have attempted the above steps with no success in attempting to repair your garbage disposal – it may be time to accept your garbage disposal is broken and needs to be replaced. Fortunately, that process is something you can do yourself OR call a local plumber to help you.